"Vigilance is the foundation upon which victories are built." Profile: Possessed of startling versatility and staggering strength, Metroplex is the robot they depend on when all other options are exhausted. In battle, he is a mighty instrument of titanic destructive force, unwavering and ever-valiant in his attack. The very ground trembles when he unleashes the explosive energies of his weaponry. But despite his enormous power, Metroplex suffers from extreme modesty. In fact, he often berates himself for not being able to contribute more to the Autobot cause, a comment that never fails to mystify his comrades and even causes some to shake their heads and laugh at its absurdity. Metroplex's role usually prevents him from being in the front lines, a situation he finds frustrating, but one the other Autobots understand and accept completely. Their friendship and respect for him is clear evidence of that. And they all prefer Metroplex in his current role. Knowing he's backing them up is a constant source of reassurance. As one Autobot once said, "No matter what happens to the rest of us, the war's not over as long as Metroplex is there." 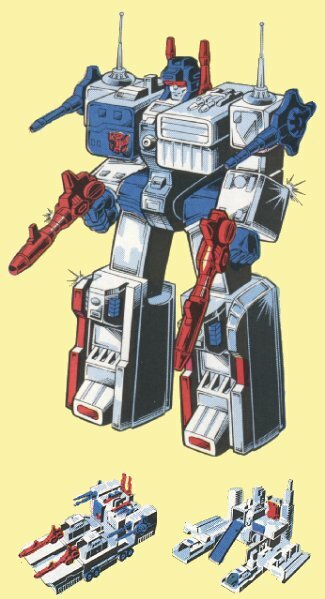 Abilities: In robot mode, Metroplex has enormous strength. He can lift 70,000 tons. His armor is the equal of any Transformer's; to merely scratch it would require at least a low-yield nuclear explosion. He has left shoulder-mounted twin high-energy MASER (microwave amplification through stimulated emission of radiation) cannons and a retractable omni-directional receiving and transmitting rod antenna in his right shoulder. His chest module contains a storage bay capable of holding a mid-size vehicle. In Autobot City mode, he has a helipad and ramps leading to the storage bay and various repair bays. Using a full complement of armatures, welders, presses, microsensors, gauges and spare parts, he's able to service up to four vehicles at any one time. His left rear tower transforms into a tank called Slammer. Metroplex can control Slammer for a maximum range of 40 miles. Slammer's cannon shoots explosive rocket-propelled mortar shells that have a 1.5-mile range. Scamper, the small sports car berthed within Metroplex, carries side-mounted electro-blasters that shoots streams of 20,000-volt electricity. In robot mode, Scamper uses a high-energy particle beam pistol. Scamper has a maximum speed of 150 mph and a range of 500 miles. Six-Gun, the small robot made literally of six guns and Metroplex's central tower, is a walking, talking artillery battery. In addition to the twin surface-to-air guided missile launchers he wears on his back, Six-Gun has ion-pulse rifles for arms and sometimes uses a seventh gun, a high-temperature acetylene pistol that can melt through most metals. Scamper and Six-Gun operate independently of Metroplex. Each has a mind of his own, although each essentially has a personality nearly identical to Metroplex and is mind-linked to him and each other. Scamper tends to be more impulsive and gregarious, Six-Gun more belligerent. The three minds together can be considered units of a single, larger mind, although Metroplex's mind is clearly dominant. Metroplex mostly uses Scamper, Six-Gun, and Slammer to scout and defend his periphery, although occasionally he'll send one or more on short missions. Metroplex's final form, the mobile Battle Station, is a wheeled platform whose formidable firepower makes him virtually untouchable. In this mode, Metroplex can have up to 12 pieces of artillery blazing away simultaneously. In addition to the previously mentioned MASER cannons, ion-pulse rifles and missile launchers, he's equipped with twin independent mounted disruptor rays on top, capable of interfering with electric currents within a target's body; two laser lances; and two front-mounted anti-matter projectors, the most powerful of all his weapons, which are capable of producing and shooting minute packets of anti-matter that obliterate anything upon contact. Metroplex can also use all these weapons in his Autobot City mode. Weaknesses: Metroplex's autonomous units - Scamper, Slammer, and Six-Gun - are all relatively vulnerable to attack as compared to Metroplex himself. In Battle Station mode, Metroplex is a rather slow-moving vehicle, making him an easy target, but his weaponry usually more than compensates for this. Using his anti-matter projectors, however briefly, is tremendously draining for Metroplex and can leave him nearly energyless.